Some ideas and suggestions for a successful alpine climbing tour. Over the years I’ve learned that the overall experience goes deeper than any reached summit. 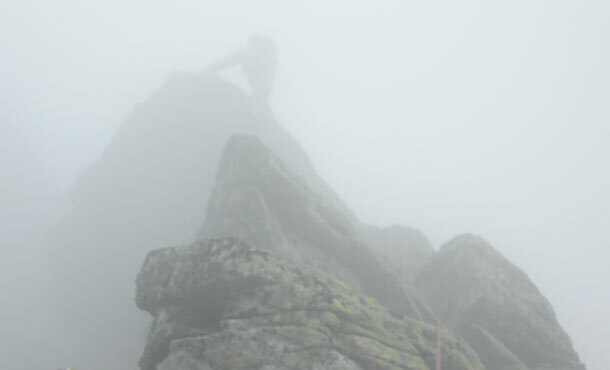 Thus I’ve found out that – beside the personal climbing skills – many other abilities decide about a successful implementation of a planned tour: A critical factor is the organization before and during the tour, the right equipment, route finding, one’s own psyche, and the knowledge when to go for the route. Unplanned bivouacs are no fun – they usually lead back to an inadequate route planning. Adapt your tour to the given circumstances: Do you have the right climbing partner for the planned challenge? Are you both comfortable with the difficulties of the tour, at your limit or even beyond? What about the equipment? How are the weather conditions? Are there options for a withdrawal? What about alternatives? It is important to talk about all those issues with your climbing partner! Is the goal of your tour focused on reaching the summit or is it about a positive overall experience? In the latter case, the decision about a withdrawal can be done sovereign, because the focus isn’t limited to the achievement of the summit. » Don’t climb the tour at any price and only go for it if the conditions are fair. Plane alternatives early enough. Then you can act confident and you won’t get into decision conflicts with yourself or your partner. If you are traveling in the mountains, you should keep this proverb in mind – the departure time decides in many respects about safety, success or failure of your tour! An example: If you’re too late in the morning, another team might be ahead of you in the route. Therefore you will need more time if the team in front of you is slower and you can’t overtake. The rockfall hazard increases, because other climbers above you can kick rocks down. Therefore you might have to wait in addition on a safe spot or you keep on climbing and take a higher risk. Neuralgic checkpoints will be delayed and force you to abort the tour. If you continue to climb, you’ll be too late at the summit or on your destination – or you don’t reach it at all, because it got dark, and you will be forces to an unplanned bivouac. If your way back lead on glaciated terrain, you will need much more time and energy in the afternoon, because the glaciers will be softened, crevasses are no longer frozen and force you to longer detours. Many little things spread over a climbing day have only one cause: a too late start in the morning. » Start off early in the morning and calculate with enough time in reserve. If you start off too late, you have to catch up on your morning negligence all day long – that’s stressful and no fun. With enough buffer time you can take it more relaxed during the entire day, you can act sovereign and thereby have more fun, inner calm and objective safety. In addition, you should be aware that also in the Alps the thunderstorm activity is increasing in the afternoon. In alpine areas with poorly protected routes, the route finding is often one of the biggest problems because it can be an important time factor. Use any possible sources of information in advance about the tour: compare climbing topos and pictures with each other, collect information from other climbers, reports from the Internet, etc. Maybe you can study the route on the approach from the distance. Glossy holds or traces of magnesium can often lead the way. Put yourself in place of the first climber: if it is an older route, it often follows corners and cracks. Is the route maybe rated with the up to the 1970s closed Welzenbach scale? Newer routes are often more direct, follow the best rock and are rated with the open French or UIAA scale. » The more information you have about the route, the more accurate will be the plan for it in your head. On your climbing day you catch up the time which you have invested in the preparation before! Use the period of rest on a belay to get an idea of the coming pitch. Does the team has a leader or act both partners equally? Is your partner an alpine-trained person or is it your friend who has a few more days of climbing experience? Who ever you go on tour with, the de facto leader position is essential (know-how, experience, emotional responsibility)! » It can lead to glaring mistakes, if the role allocation and functions within your team aren’t clearly defined – we are running after each other (one relies on the others) and, for example, don’t make an important decision early enough. 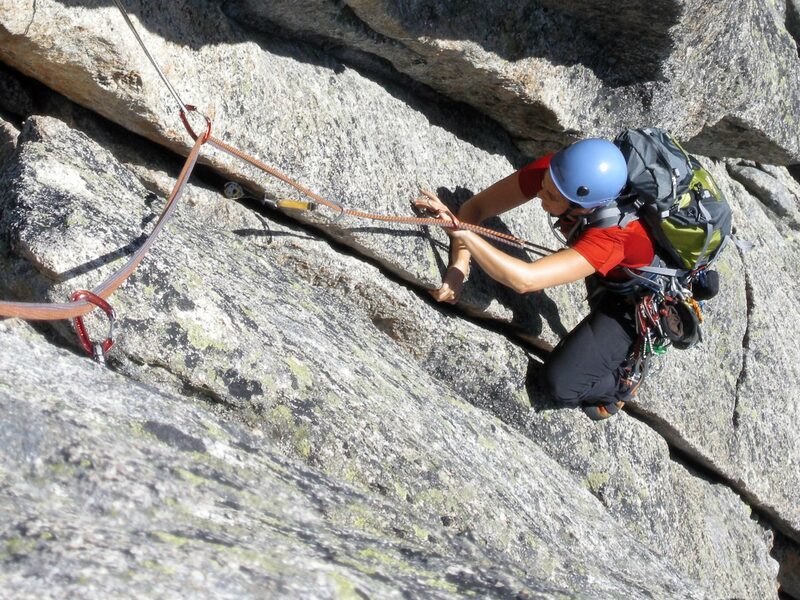 Of course, your climbing skill is a cornerstone for alpine climbing tours, nevertheless many different factors play an important role for a successful trip – know-how and experience are determining. Think and plan about these facts in advance, then you are able to respond on changing circumstances spontaneously and appropriately. Especially addressed to newcomers, I recommend to take the affair relaxed. Adjust the route on your personal level. Otherwise, things are getting out of control faster than you think and the tour becomes unpredictable and risky. It is better to increase the difficulty slowly (climbing grade, length, conditions, season) to gain experience, learn from it and apply it on future tours. The successful implementation of your planned tour comes with the right attitude. Actually, we thought “it will work out” – the orientation then was more or less sub-optimal.